I am amazed, over and over again, at the mysterious ways in which the universe works. We have been so busy ignoring the endless signs around us, that finally the universe chooses to whack us on the head and spell it out for us. Amazing! But before we give up hope, and we have all been to that place of despair and frustration at one point, we need to come to the important understanding that the timing of all this ISN’T by chance. Every past historical reference, from the Mayan Calendar to the Jewish Calendar, from past prophets to the Bible itself, has foreseen these stirring of cosmic events at exactly these times. There is a shift taking place and we have all noticed it. This is our wake up call. We have come to a crossroad and we need to make a choice. Not later. Not someday. Now. 5,000 people from around the country and abroad are needed holding hands to surround the walls of the Old City of Jerusalem in a unified embrace. We call upon lovers of Jerusalem of all walks of life, of all religions, from all areas of the world and of course all of Israel, Palestine and Jerusalem. 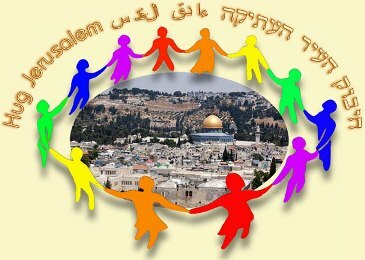 The purpose of this event is to unite diverse people though our common denominator, our Love for the holy city Jerusalem. This act is both simple and meaningful, offering the potential to redefine our relationship with each other and create new realities. So why May 21st? Why Jerusalem? Well, you can click here to learn more about the structure and significance of this special event. The bottom line is, if you are part of the rapidly growing population that senses this shift happening all around us, it is our responsibility to do something about it. May we all make the right choice. 1 Praise awaits you, O God, in Zion; to you our vows will be fulfilled. O you who hear prayer, to you all men will come. When we were overwhelmed by sins, you forgave our transgressions. Praise God! Oh, how I would Love to be there holding hands with all those who Love the Great I Am and His cherished city, Jerusalem. What a beautiful Shavuot this will be! Thank you for this, as this is my first year ever counting the Omer, I will be there is spirit, praying blessings and peace upon Jerusalem.